God the Father is a title given to God in various religions, most prominently in Christianity. In mainstream trinitarian Christianity, God the Father is regarded as the first person of the Trinity, followed by the second person God the Son (Jesus Christ) and the third person God the Holy Spirit. Since the second century, Christian creeds included affirmation of belief in "God the Father (Almighty)", primarily as his capacity as "Father and creator of the universe". However, in Christianity the concept of God as the father of Jesus Christ goes metaphysically further than the concept of God as the Creator and father of all people, as indicated in the Apostle's Creed where the expression of belief in the "Father almighty, creator of heaven and earth" is immediately, but separately followed by in "Jesus Christ, his only Son, our Lord", thus expressing both senses of fatherhood. In Christianity, God is addressed as the Father, in part because of his active interest in human affairs, in the way that a father would take an interest in his children who are dependent on him and as a father, he will respond to humanity, his children, acting in their best interests. Many believe they can communicate with God and come closer to him through prayer – a key element of achieving communion with God. In general, the title Father (capitalized) signifies God's role as the life-giver, the authority, and powerful protector, often viewed as immense, omnipotent, omniscient, omnipresent with infinite power and charity that goes beyond human understanding. For instance, after completing his monumental work Summa Theologica, Catholic St. Thomas Aquinas concluded that he had not yet begun to understand ‘God the Father’. Although the term "Father" implies masculine characteristics, God is usually defined as having the form of a spirit without any human biological gender, e.g. the Catechism of the Catholic Church #239 specifically states that "God is neither man nor woman: he is God". Although God is never directly addressed as "Mother", at times motherly attributes may be interpreted in Old Testament references such as Isa 42:14, Isa 49:14–15 or Isa 66:12–13. In the New Testament, the Christian concept of God the Father may be seen as a continuation of the Jewish concept, but with specific additions and changes, which over time made the Christian concept become even more distinct by the start of the Middle Ages. The conformity to the Old Testament concepts is shown in Matthew 4:10 and Luke 4:8 where in response to temptation Jesus quotes Deuteronomy 6:13 and states: "It is written, you shall worship the Lord your God, and him only shall you serve." 1 Corinthians 8:6 shows the distinct Christian teaching about the agency of Christ by first stating: "there is one God, the Father, of whom are all things, and we unto him" and immediately continuing with "and one Lord, Jesus Christ, through whom are all things, and we through him." This passage clearly acknowledges the Jewish teachings on the uniqueness of God, yet also states the role of Jesus as an agent in creation. Over time, the Christian doctrine began to fully diverge from Judaism through the teachings of the Church Fathers in the second century and by the fourth century belief in the Trinity was formalized. According to Mary Rose D'Angelo and James Barr, the Aramaic term Abba was in the early times of the New Testament neither markedly a term of endearment, nor a formal word; but the word normally used by sons and daughters, throughout their lives, in the family context. According to Marianne Thompson, in the Old Testament, God is called "Father" with a unique sense of familiarity. In addition to the sense in which God is "Father" to all men because he created the world (and in that sense "fathered" the world), the same God is also uniquely the law-giver to his chosen people. He maintains a special, covenantal father-child relationship with the people, giving them the Shabbat, stewardship of his prophecies, and a unique heritage in the things of God, calling Israel "my son" because he delivered the descendants of Jacob out of slavery in Egypt [Hosea 11:1] according to his covenants and oaths to their fathers, Abraham, Isaac and Jacob. In the Hebrew Bible, in Isaiah 63:16 (JP) it reads: "For You are our father, for Abraham did not know us, neither did Israel recognize us; You, O [YHWH], are our father; our redeemer of old is your name." To God, according to Judaism, is attributed the fatherly role of protector. He is titled the Father of the poor, of the orphan and the widow, their guarantor of justice. He is also titled the Father of the king, as the teacher and helper over the judge of Israel. According to Alon Goshen-Gottstein, in the Old Testament "Father" is generally a metaphor; it is not a proper name for God but rather one of many titles by which Jews speak of and to God. In Christianity fatherhood is taken in a more literal and substantive sense, and is explicit about the need for the Son as a means of accessing the Father, making for a more metaphysical rather than metaphorical interpretation. In Christianity the concept of God as the Father of Jesus is distinct from the concept of God as the Creator and Father of all people, as indicated in the Apostle's Creed. The profession in the creed begins with expressing belief in the "Father almighty, creator of heaven and earth" and then immediately, but separately, in "Jesus Christ, his only Son, our Lord", thus expressing both senses of fatherhood within the creed. Since the second century, creeds in the Western Church have included affirmation of belief in "God the Father (Almighty)", the primary reference being to "God in his capacity as Father and creator of the universe". This did not exclude either the fact the "eternal father of the universe was also the Father of Jesus the Christ" or that he had even "vouchsafed to adopt [the believer] as his son by grace". Creeds in the Eastern Church (known to have come from a later date) began with an affirmation of faith in "one God" and almost always expanded this by adding "the Father Almighty, Maker of all things visible and invisible" or words to that effect. By the end of the first century, Clement of Rome had repeatedly referred to the Father, Son and Holy Spirit, and linked the Father to creation, 1 Clement 19.2 stating: "let us look steadfastly to the Father and Creator of the universe". Around AD 213 in Adversus Praxeas (chapter 3) Tertullian is believed to have provided a formal representation of the concept of the Trinity, i.e. that God exists as one "substance" but three "Persons": The Father, the Son and the Holy Spirit, and with God the Father being the Head. Tertullian also discussed how the Holy Spirit proceeds from the Father and the Son. While the expression "from the Father through the Son" is also found among them. The Nicene Creed, which dates to 325, states that the Son (Jesus Christ) is "eternally begotten of the Father", indicating that their divine Father-Son relationship is seen as not tied to an event within time or human history. 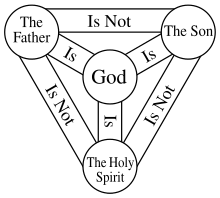 To Trinitarian Christians (which include Roman Catholics, Eastern Orthodox, Oriental Orthodox, and most but not all Protestant denominations), God the Father is not a separate God from God the Son (of whom Jesus is the incarnation) and the Holy Spirit, the other hypostases of the Christian Godhead. In Eastern Orthodox theology, God the Father is the arche or principium ("beginning"), the "source" or "origin" of both the Son and the Holy Spirit, and is considered the eternal source of the Godhead. The Father is the one who eternally begets the Son, and the Father through the Son eternally breathes the Holy Spirit. As a member of the Trinity, God the Father is one with, co-equal to, co-eternal, and consubstantial with the Son and the Holy Spirit, each Person being the one eternal God and in no way separated: all alike are uncreated and omnipotent. Because of this, the Trinity is beyond reason and can only be known by revelation. 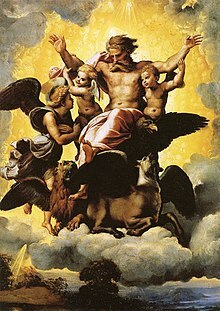 The Trinitarian concept of God the Father is not pantheistic in that he is not viewed as identical to the universe or a vague notion that persists in it, but exists fully outside of creation, as its Creator. He is viewed as a loving and caring God, a Heavenly Father who is active both in the world and in people's lives. He created all things visible and invisible in love and wisdom, and created man for his own sake. The concept of fatherhood of God does appear in the Old Testament, but is not a major theme. While the view of God as the Father is used in the Old Testament, it only became a focus in the New Testament, as Jesus frequently referred to it. This is manifested in the Lord's prayer which combines the earthly needs of daily bread with the reciprocal concept of forgiveness. And Jesus' emphasis on his special relationship with the Father highlights the importance of the distinct yet unified natures of Jesus and the Father, building to the unity of Father and Son in the Trinity. A number of Christian groups reject the doctrine of the Trinity, but differ from one another in their views regarding God the Father. 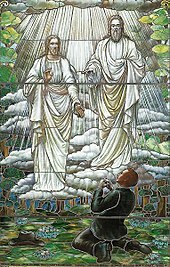 In Mormon theology, the most prominent conception of God is as a divine council of three distinct beings: Elohim (the Father), Jehovah (the Son, or Jesus), and the Holy Spirit. The Father and Son are considered to have perfected, physical bodies, while the Holy Spirit has a body of spirit. Mormons believe that God the Father presides over both the Son and Holy Spirit, where God the Father is greater than both, but they are one in the sense that they have a unity of purpose. Mormons do not distinguish God as a separate ontological species from humans, a concept they believe was originated by post-apostolic theologians who incorporated elements of Greek philosophy into Christian doctrine. Mormons teach that the title of Father is not figurative, because humans are literally the spirit offspring of God (Acts 17:28–29, Hebrews 12:9). In this sense, they consider Jesus Christ their older brother (John 20:17), as he is the first born, or first begotten of God's children (Colossians 1:15, Hebrews 1:26; 12:23). Biblical references to Christ as the "only begotten", in contrast, refer to God being the Father of Christ's mortal body, born of the virgin Mary. The terms "Father" and "Son" imply a lineage of beings in Mormonism and in all non-symbolic usage of these words. In the Mormon hymn, "If You Could Hie to Kolob", there is no beginning to the lineage of exalted, resurrected personages that are in perfect unity. In Jehovah's Witness theology, only God the Father (Jehovah) is the one true almighty God, even over his Son Jesus Christ. They teach that the pre-existent Christ is God's First-begotten Son, and that the Holy Spirit is God's active force (projected energy). They believe these three are united in purpose, but are not one being and are not equal in power. While the Witnesses acknowledge Christ's pre-existence, perfection, and unique "Sonship" from God the Father, and believe that Christ had an essential role in creation and redemption, and is the Messiah, they believe that only the Father is without beginning. They say that the Son was the Father's only direct creation, before all ages. God the Father is emphasized in Jehovah's Witness meetings and services more than Christ the Son, as they teach that the Father is greater than the Son. Although similarities exist among religions, the common language and the shared concepts about God and his title Father among the Abrahamic religions is quite limited, and each religion has very specific belief structures and religious nomenclature with respect to the subject. While a religious teacher in one faith may be able to explain the concepts to his own audience with ease, significant barriers remain in communicating those concepts across religious boundaries. In Hinduism, Bhagavan Krishna in the Bhagavad Gita, chapter 9, verse 17, stated: "I am the Father of this world, the Mother, the Dispenser and the Grandfather", one commentator adding: "God being the source of the universe and the beings in it, He is held as the Father, the Mother and the Grandfather". A genderless Brahman is also considered the Creator and Life-giver, and the Shakta Goddess is viewed as the divine mother and life-bearer. Unlike in Judaism, the term "father" is not formally applied to God by Muslims, and the Christian notion of the Trinity is rejected in Islam. Even though traditional Islamic teaching does not formally prohibit using the term "Father" in reference to God, it does not propagate or encourage it. There are some narratives of the Islamic prophet Muhammad in which he compares the mercy of God toward his worshipers to that of a mother to her infant child. In Judaism, the use of the "Father" title is generally a metaphor, referring to the role as Life-giver and Law-giver, and is one of many titles by which Jews speak of and to God. The Jewish concept of God is that God is non-corporeal, transcendent and immanent, the ultimate source of love, and a metaphorical "Father". The Aramaic term for father (Hebrew: אבא‎, abba) appears in traditional Jewish liturgy and Jewish prayers to God (e.g. in the Kaddish). According to Ariela Pelaia, in a prayer of Rosh Hashanah, Areshet Sfateinu, an ambivalent attitude toward God is demonstrated, due to his role as a father and as a king. Free translation of the relevant sentence may be: "today every creature is judged, either as sons or as slaves. If as sons, forgive us like a father forgives his son. If as slaves, we wait, hoping for good, until the verdict, your holy majesty." Another famous prayer emphasizing this dichotomy is called Avinu Malkeinu, which means “Our Father Our King” in Hebrew. Usually the entire congregation will sing the last verse of this prayer in unison, which says: "Our Father, our King, answer us as though we have no deed to plead our cause, save us with mercy and loving-kindness." The Guru Granth consistently refers to the creator as "He" and "Father". This is because the Granth is written in north Indian Indo-Aryan languages (mixture of Punjabi and dialects of Hindi) which have no neutral gender. Since the Granth says that the God is indescribable, the God has no gender according to Sikhism. God in the Sikh scriptures has been referred to by several names, picked from Indian and Semitic traditions. He is called in terms of human relations as father, mother, brother, relation, friend, lover, beloved, husband. Other names, expressive of his supremacy, are thakur, prabhu, svami, sah, patsah, sahib, sain (Lord, Master). 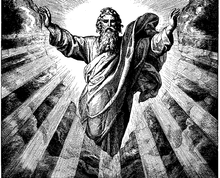 For about a thousand years, no attempt was made to portray God the Father in human form, because early Christians believed that the words of Exodus 33:20 "Thou canst not see my face: for there shall no man see Me and live" and of the Gospel of John 1:18: "No man hath seen God at any time" were meant to apply not only to the Father, but to all attempts at the depiction of the Father. Typically only a small part of the body of Father would be represented, usually the hand, or sometimes the face, but rarely the whole person, and in many images, the figure of the Son supplants the Father, so a smaller portion of the person of the Father is depicted. 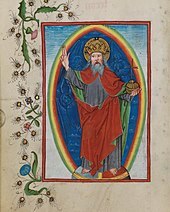 In the early medieval period God was often represented by Christ as the Logos, which continued to be very common even after the separate figure of God the Father appeared. Western art eventually required some way to illustrate the presence of the Father, so through successive representations a set of artistic styles for the depiction of the Father in human form gradually emerged around the tenth century CE. By the twelfth century depictions of a figure of God the Father, essentially based on the Ancient of Days in the Book of Daniel had started to appear in French manuscripts and in stained glass church windows in England. In the 14th century the illustrated Naples Bible had a depiction of God the Father in the Burning bush. By the 15th century, the Rohan Book of Hours included depictions of God the Father in human form or anthropomorphic imagery. 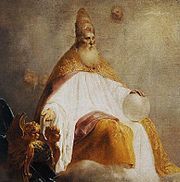 The depiction remains rare and often controversial in Eastern Orthodox art, and by the time of the Renaissance artistic representations of God the Father were freely used in the Western Church. ^ a b c d "God the Father in Rabbinic Judaism and Christianity: Transformed Background or Common Ground?, Alon Goshen-Gottstein. The Elijah Interfaith Institute, first published in Journal of Ecumenical Studies, 38:4, Spring 2001" (PDF). elijah-interfaith.org. Archived from the original (PDF) on 17 December 2012. ^ Bartolo-Abela, M. (2012). The Divine Heart of God the Father (2nd ed.). p. 108. ISBN 978-0983715290. ^ Devotion to the Divine Heart of God the Father (3rd ed.). 2012. p. 148. ISBN 978-0-9837152-8-3. ^ James Barr, "Abba isn't 'daddy'", Journal of Theological Studies, 39:28–47. ^ "The Aramaic Blog: Abba Isn't Daddy – The Traditional Aramaic Father's Day Discussion". aramaicdesigns.blogspot.com. ^ Bauckham, Richard (2011). Jesus. Oxford University Press. p. 65. ISBN 978-0199575275. ^ Marianne Meye Thompson, The promise of the Father: Jesus and God in the New Testament ch. 2 God as Father in the Old Testament and Second Temple Judaism p.35 2000. "Christian theologians have often accentuated the distinctiveness of the portrait of God as Father in the New Testament on the basis of an alleged discontinuity." ^ Tertullian Adversus Praxeas 4 (ANF 3:599–600): "I believe the Spirit to proceed from no other source than from the Father through the Son"
^ Tertullian Adversus Praxeas 5 (ANF 3:600–601). ^ O'Collins & Farrugia 2015, p. 157. ^ "Godhead", True to the Faith, The Church of Jesus Christ of Latter-day Saints, 2004 . See also: "God the Father", True to the Faith, The Church of Jesus Christ of Latter-day Saints, 2004 . ^ "ONE. See God, Godhead; Unity", Guide to the Scriptures, The Church of Jesus Christ of Latter-day Saints, 2005 . ^ "The only true God and Jesus Christ whom He hath sent", Jeffrey R Holland, The Church of Jesus Christ of Latter-day Saints, 2007 . ^ a b Saints, The Church of Jesus Christ of Latter Day. "God the Father". www.lds.org. ^ Anderson, Elder Joseph. "A Testimony of Christ – Elder Joseph Anderson". lds.org. ^ Insight on the Scriptures. 2. 1988. p. 1019. ^ James Roberts – Oneness vs. Trinitarian Theology[permanent dead link] – Westland United Pentecostal Church. Retrieved 13 April 2012. ^ "Hadith – Book of Good Manners and Form (Al-Adab) – Sahih al-Bukhari - Sunnah.com – Sayings and Teachings of Prophet Muhammad (صلى الله عليه و سلم)". sunnah.com. ^ Berger, David; Wyschogrod, Michael (1978). Jews and "Jewish Christianity". [New York]: KTAV Publ. House. ISBN 0870686755. ^ Singer, Tovia (2010). Let's Get Biblical – In depth Study Guide. Outreach Judaism (1998). ASIN B0006RBS3K. ^ Ariela Pelaia – What Is Rosh HaShanah? – The Jewish New Year of Rosh HaShanah – Rosh HaShanah Liturgy – About.com – Judaism. Retrieved 7 December 2013. ^ a b Real Sikhism – God – Who is God? What does God look like? – Real Sikhism – Exploring the Sikh Religion. Retrieved 8 April 2014.